Welcome to my first “Let’s Get Crafty” tutorial. 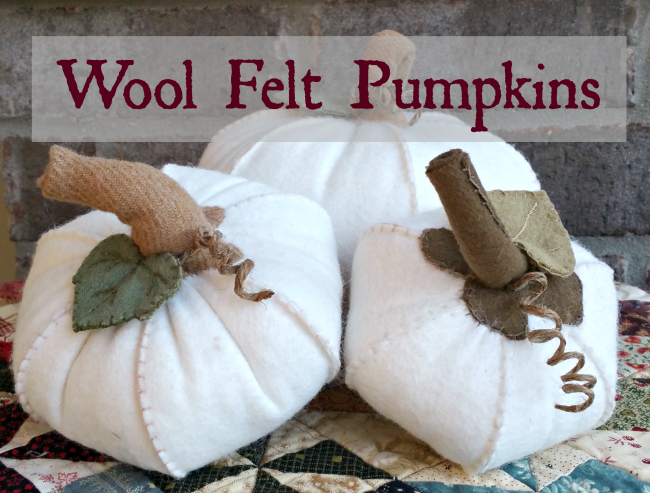 These wool felt pumpkins are quick and easy (and BEYOND adorable) but have great detail to take them a step above the “gathered fabric circle” pumpkin. I love working with wool. 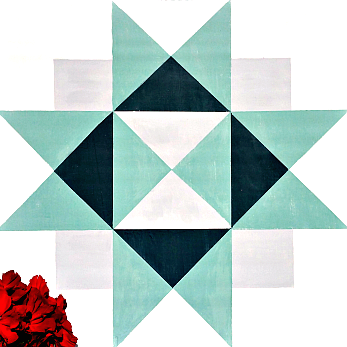 The edges don’t fray, it looks beautiful embroidered, and it’s easy to work with even if your pieces aren’t perfectly cut. Some of the steps can even be done with a hot glue gun! Wool Felt– I order my wool felt from Nutmeg Hare and Three Sheep Studio. They both carry great textured hand dyed wool. 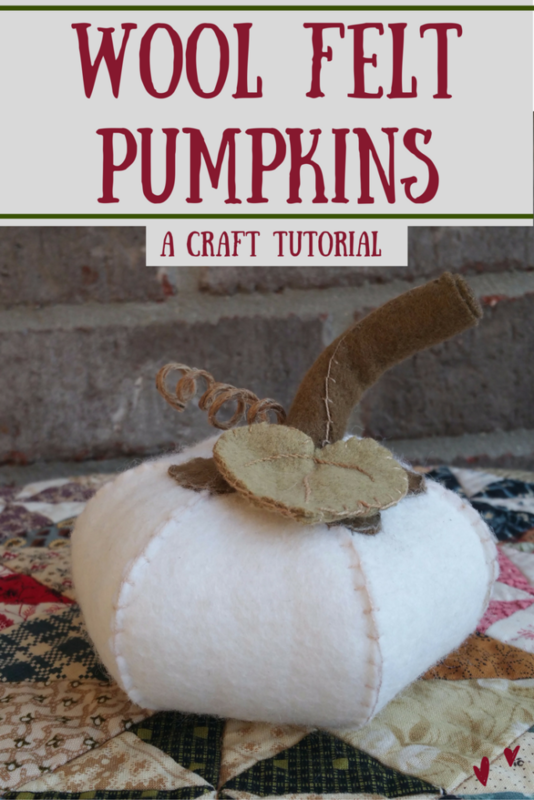 You will make a mini “bean bag” that holds the crushed walnuts or doll pellets inside the pumpkin. I bought mine from Amazon because one of my major goals in life is to find ways to NEVER have to leave my house! 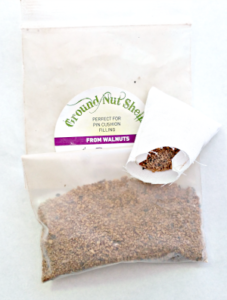 Here’s the link for the crushed walnuts or doll pellets if you like buying things in your jammies (or loungewear IF you have lipgloss on). 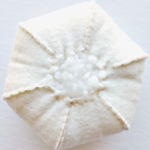 Needles– I use Mary Arden Chenille needles. You need a needle with a large eye. Embroidery Floss- I use Valdani size 12. Size 12 is the “weight” of the thread (how thick the thread is). If you don’t have that “weight” you can use 2 or 3 strands of a DMC floss. Thread– You will need an all purpose thread to attach the jute coil and to stitch the wire to the wool felt square. 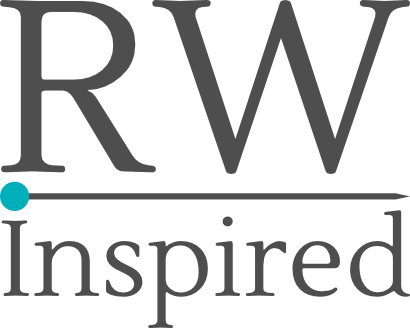 Wire– I used a 24 gauge florist wire because that’s what I had. Any wire will work as long as you can bend it. Scissors– Any sharp scissors will work. I have a pair of Karen Kay Buckley Perfect Scissors. I LOVE them…They cut wool beautifully! Stuffing– any fiberfill stuffing will work. 10 inch piece of Jute Twine, Mod Podge (or Elmers Glue), and a chopstick (or pen) to wrap the twine around. Hot Glue Gun- I will let you know when you can “choose your own adventure” and use hot glue instead of sewing. 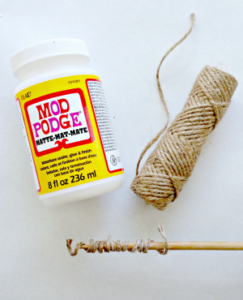 Jute Coil– Dip your fingers (or the jute twine) in Mod Podge and cover the twine or run a bead of glue down the length. Make sure the twine gets coated with glue but NOT dripping. Wrap the twine around a chopstick or pen and hold it for a few seconds. Gently slide the twine off and lay it down on a piece of parchment to dry. 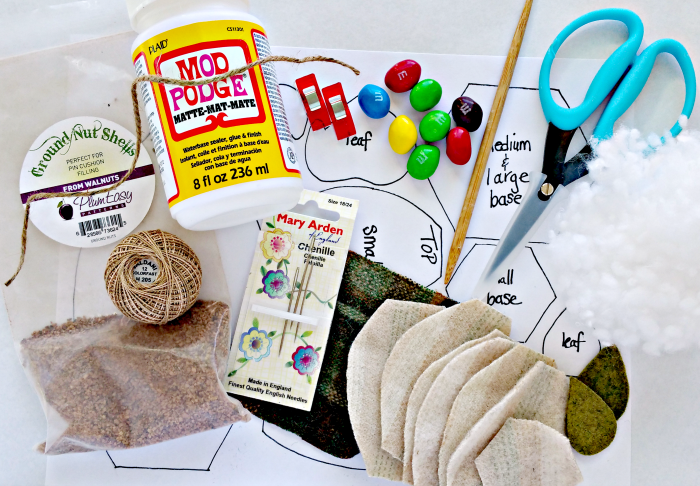 You can sew OR use your glue gun for this step. Fold your rectangle in half to make a square. Sew down the left and right side (or glue down) leaving the top open. If you choose to sew the sides, turn your square right side out after stitching to enclose the seams. Fill approx 2/3rds full of either pellets or crushed walnut shells. Glue the opening closed OR turn the edges down a quarter-inch and topstitch closed. Trace 1 Base and 6 body pieces onto your wool felt. Sew 2 bodies together on one side using a buttonhole stitch. Repeat for a total of 3 pairs. Sew 2 pairs together on one side ( it will look like a “chain” of pumpkin slices) and sew both sides of the last pair to enclose the pumpkin body. 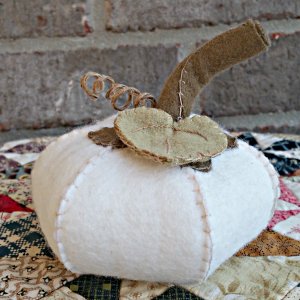 Stitch the hexagon base to the body of the pumpkin using the same buttonhole stitch. 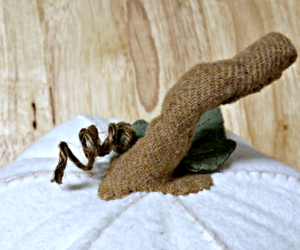 Drop your muslin “bean bag” inside your pumpkin and stuff with fiberfill. Re-thread your needle and tie a large knot. Draw your thread through from the inside (to hide the knot) and take large stitches (basting stitches) about 1/4 inch from edge all the way around the pumpkin. Pull the thread gently to draw in the top and give the pumpkin some dimension. Secure with a knot on the inside of the pumpkin. Take your twisted piece of wire and lay it approx 1/4 inch from one edge of your wool stem square. Fold edge of wool over the wire. Hot glue or stitch wool to secure the wire. Once your wire is secured, roll your wool square tightly to create the spiral. Now comes the “tricky” part. You want to UN-roll the wider end of your wool stem to reveal the innermost roll. Trim that away to the wire WITHOUT cutting the wire itself. Once that excess is trimmed away, you’ll be able to spread out the base of the stem to attach it to the pumpkin body. I made a few slits in the wool to spread out the stem even wider and cut curves to make it look more natural. Stitch the base of the stem to the pumpkin over the hole. If you made a little curly coil, you can secure it to the wool stem with hot glue or a few stitches through the twine and into the stem. If you’re using hot glue, you only need 1 leaf. Dab a bit of hot glue to the middle of the wider end leaf and pinch together to create a little pucker. Hot glue the back side to your Pumpkin Stem. I used an embroidery stitch called the “Stem Stitch” on one of the leaves to create the veins. I used the buttonhole stitch to secure the front and back leaf together. 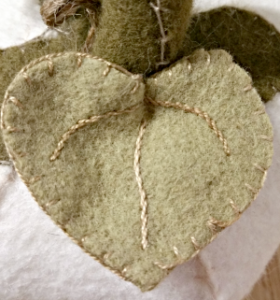 Fold the leaf in half and run a few stitches through all the layers toward the base of the leaf to create the pucker. Stitch the leaf to your Pumpkin Stem. Bask in the glory of your craftiness!! Take a pic and let me see! Follow me over on Instagram to see ways to customize your pumpkin for a hostess gift, birthday present, or to keep for your very own and not share with ANYBODY! How about inviting some friends over for a girls night and get crafty! Pajamas, frosty beverage, Peanut M&M’s, hot glue, and needles! I hope you love making these, Beth! They were lots of fun to create! These are SO stinkin’ CUTE!!!!! I need to try my hand at making my own pumpkin patch of felted “Punkins”! ?? Pinned!!? They are a ton of fun, Sarah. You could make them in your favorite color! White pumpkins for the Win!